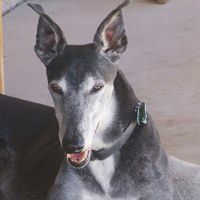 Sweet 8-year-old black and white male greyhound needs new loving home. He weighs about 60 pounds and, like most greyhounds, he is a very easy walker. He is neutered, is up to date on shots, housebroken, gets along well with his house canine companion and other dogs and he is very outgoing with people (cats are unknown). Polo was adopted from rescue five years ago but his dad has died and mom is unable to take on his care alone since she works several long days each week.